The Northern Kenai Peninsula Management Area (NKPMA) are all Kenai Peninsula freshwater drainages from the north bank of Ingram Creek south to the south bank of the Kasilof River. On the west side of Cook Inlet the Management Area is comprised of freshwater drainages from the West Forelands south to Spring Point which is just north of Chinitna Bay. Marine waters of the NKPMA are all waters from the latitude of the East Forelands south to the latitude of Kasilof River; all marine waters in close proximity (several miles) to the west side of Cook Inlet from the West Forelands south to Spring Point. 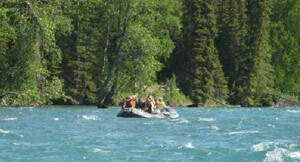 This area is administered from the Soldotna Office of the Department of Fish and Game. Larger communities located within the NKPMA include Kenai and Soldotna. Smaller communities are Hope, Cooper Landing, Moose Pass and Sterling. This management area is linked to the state's highway system via the Sterling and Seward Highways which provide sport anglers access to many of the area's major fisheries. Remote areas of the NKPMA (west side of Cook Inlet) can be accessed via wheel or float equipped aircraft, boat or walking. The NKPMA offers diverse fishing opportunities for recreational and personal use anglers. Anglers can target four species of North Pacific salmon, pink, coho, sockeye and Chinook. Fisheries for these species occur primarily in freshwater and to a lesser degree in saltwater. Anglers can also target salmon stocked into various landlocked lakes. Popular fisheries also occur on the area's anadromous stocks of Dolly Varden, steelhead trout, and smelt. Resident stocks of rainbow trout and lake trout also support popular sport fisheries. Less popular fisheries occur for Arctic grayling and invasive northern pike.